My interest at the time was on stained-glass windows, and I was preparing to capture the beauty of stained glass in watercolors. 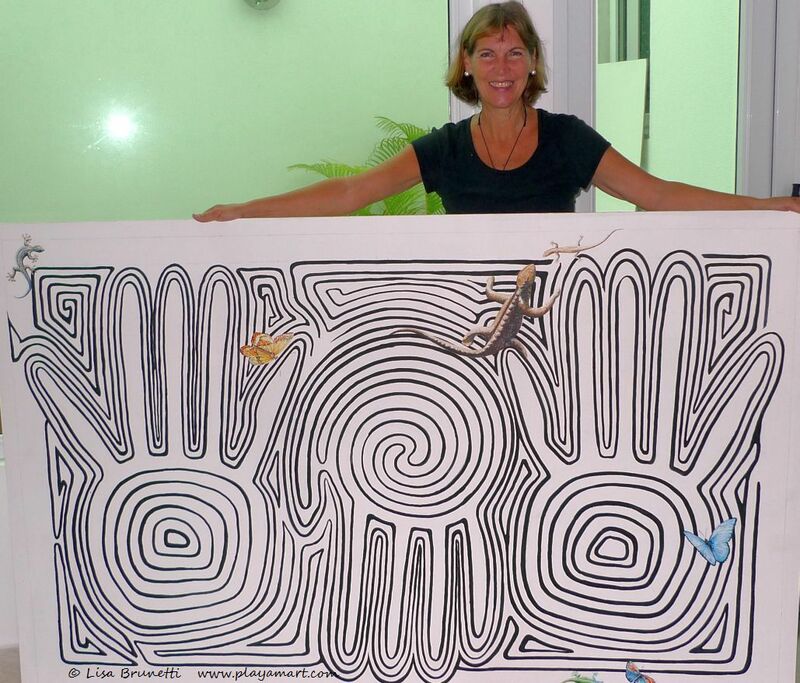 The first ‘Mola” concept was a collective project to nudge Barbara out of a painting block. I sketched the design, and she and her daughter Bobbe and I floated the colors with a relaxed ease. The next year when I returned, we created another “I Can Do This” project when her friend Donaa visited. We took turns drawing the balloons, then enjoyed filling in colors. 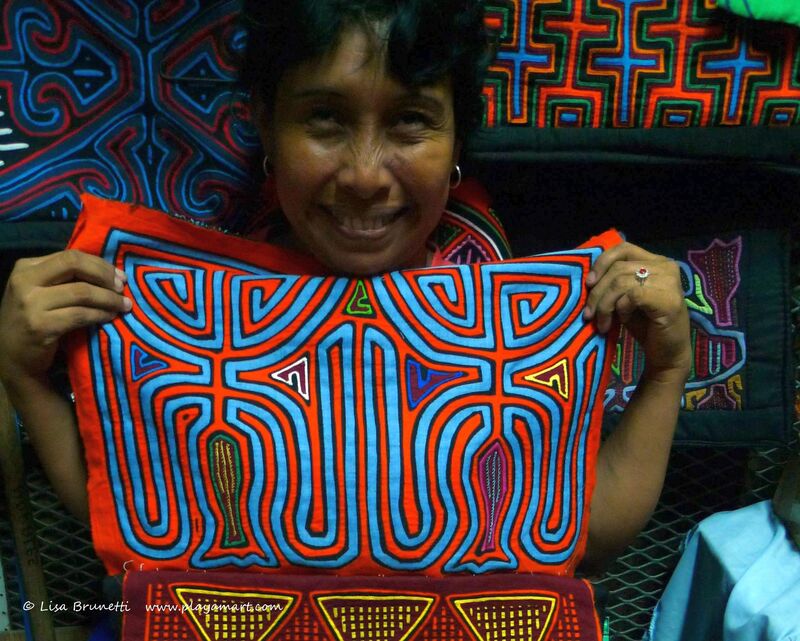 Not scared of color, the Kunas used bright-colored layers of fabric to create the unique textiles based on designs that go back to pre-Columbian times. Long-ago Indians painted those designs on their bodies. The concept evolved into a fine craft after the Indians were forced to wear clothing. The Kunas most likely would strongly disagree with anyone who scoffs at the issue of global warming. Many are relocating because rising seas are claiming their picturesque San Blas Islands. 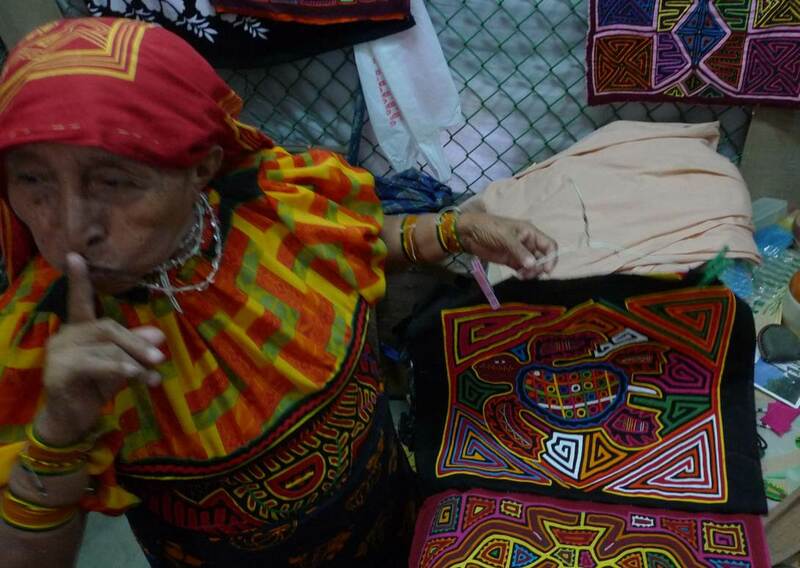 Based on ancient designs like the mola textiles, Tres Manos was inspired by Ecuador’s Jama Coaque Indian culture. Very beautiful and colorful work. Absolutely gorgeous colors and designs! I love to sit and colour for hours. Takes my mind to a level nothing else can. Wondering if you have ever been Freshly Pressed. Hmmmm – well if not, YOU should be! you are so wonderful! thank you! the amazing feedback that all of you give is reward enough! The only “k” words in Spanish I can think of are those beginning with “kilo-“. Good thing you knew about the Kunas or you wouldn’t have been able to write this fabulous post. hey! i wonder how that town got its name? i loved the images from the brewery. everyone looked nice and relaxed and enjoying a great evening. i like the glasses – you look sophisticated!!! I so love the gradually-growing colors in this post. I love coloring too. I usually make use of the water-color pencils of Faber Castell, but I havent done this for quite awhile now. 🙂 Great photos. maybe you’ll pick up those pencils again! thanks so much for your comment, myra, and welcome aboard! yes, that was such a great memory with that precious woman! i returned the next time to buy more from her, but she wasn’t there. hopefully the NEXT time she will be back in place! wow. i am so glad that this humble post appealed to you! the textiles are so bright and happy, and you can most likely see why the mood transfers to my work as well! Beautiful designs and great colors. I’m so glad you diverted from your Spanish alphabet to bring us this post. What vibrant colors and beautiful textures. What beautiful people! they are beautiful; thank you! as with you, there is so much to see, so much to do, and we never run out of material to share. i would love to spend a month with those amazing creative artists and have an amazing cultural exchange. sigh, so little time to squeeze all one can into each day! Lovely to read and hear more about the kuna and their great love of colour. So sad about their islands. It’s a serious/real issue for our small Pacific Islands too. We should all be concerned. that’s a great one to love! thank you, and maybe we can figure out a way to have a virtual workshop! Love those colours they sing and it is a happy song. 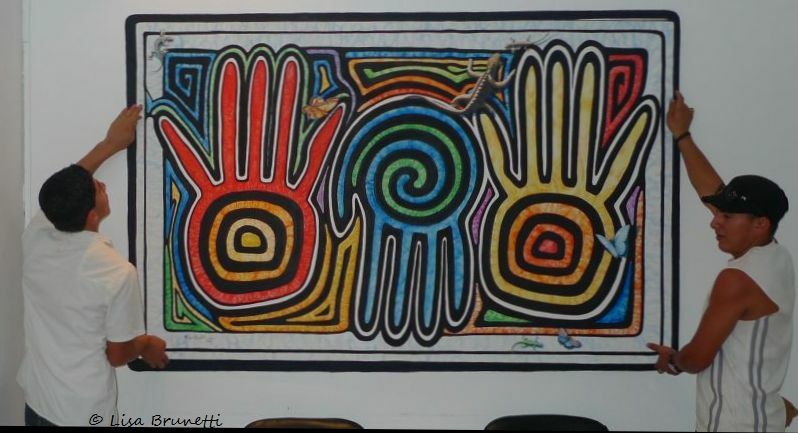 You probably know, the Australian Indigenous People do dot painting and originally used earth colours ochre yellow and reds, charcoal and white. They told their stories in pictures they painted. Some still survive from many years back. it would be so great to meet those artists and interact with them. what an amazing legacy, and they are so unique! i’m glad you enjoyed this post! thanks, jack! It’s easy to see why you love that part of the world! 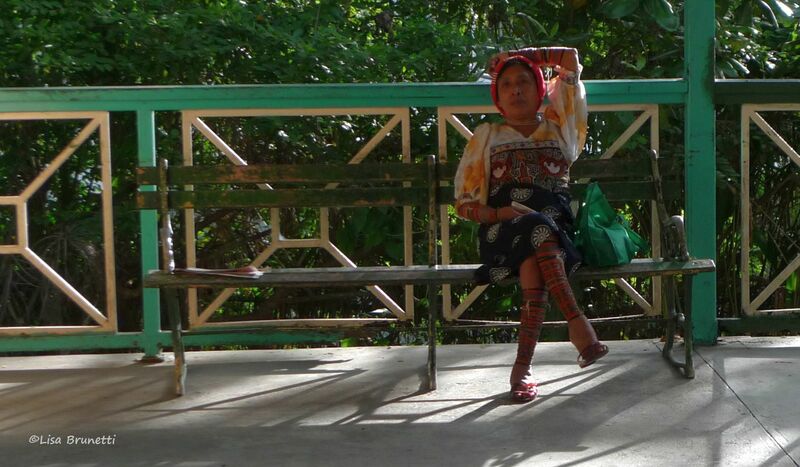 Every time I research the Kuna Indians, I am wistful for a wanderlust journey that takes me to the San Blas Islands. Hopefully within the next year I can visit and have a cultural exchange. That would by absolutely amazing! Beautiful images! 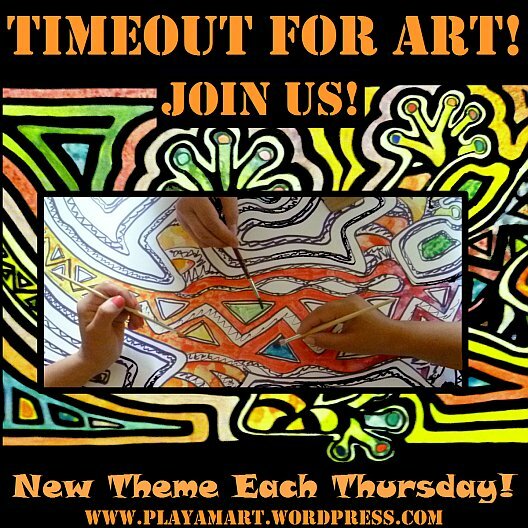 The designs remind me of Australian Aboriginal dot paintings, which are in my lesson plan for today. Lovely post, thank you! Eye candy!! Just completely delicious! I too would want every one – would want a wall of them. I loved them from the first time I saw them, too, but haven’t had the opportunity to go there, so this is great – seeing the women. 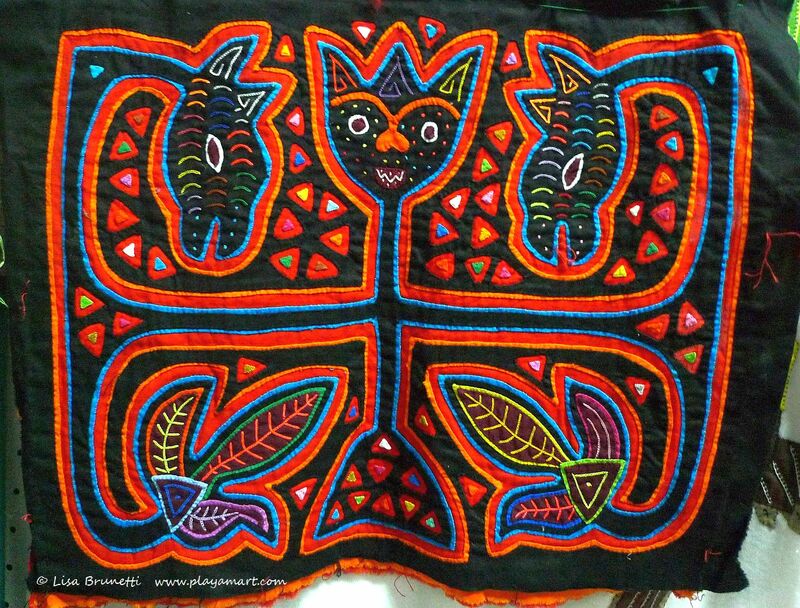 (Hmong textiles, which I’m sure you know about, have a similar look, and I think some are made the same way). I enjoyed seeing the evolution of the mola paintings from this perspective – starting with a visit to the place where the idea took root. 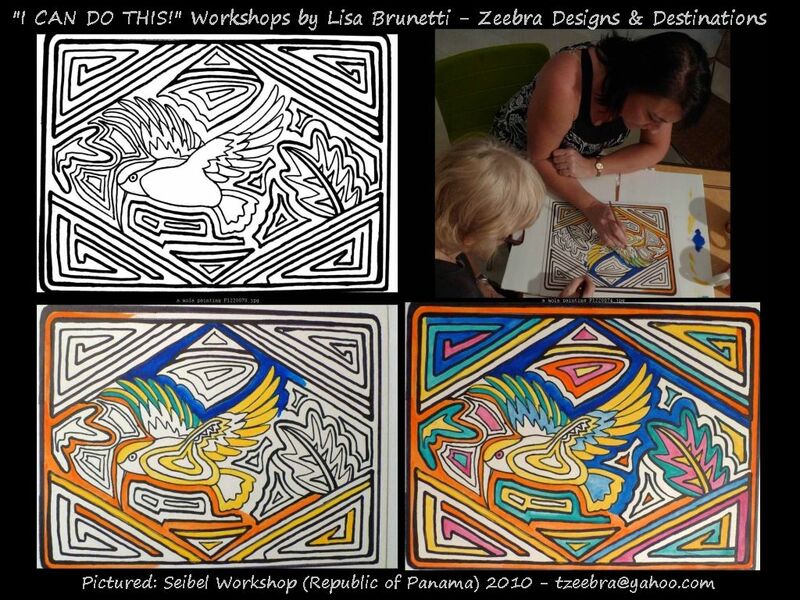 And then tying in the I Can Do This workshops – it looks like those started around the same concept? It’s a great post. One more thing – what can you tell us about the decorations the women wear on their legs and arms? Thank you Lisa! my friend barb is coming to visit in a few weeks, and i will ask her to purchase a few of those arm/leg bands.. those elastic bands are made up of beads – i think! we’ll nudge barb into finding an accomplice and getting those facts confirmed for me. it’s been several years since i’ve visited panama. i had mentioned my friend barb in this post, so you had a really easy reason to have ‘barb’ on your mind.. if you’d like, i”ll change it and remove this comment, though it makes me laugh! 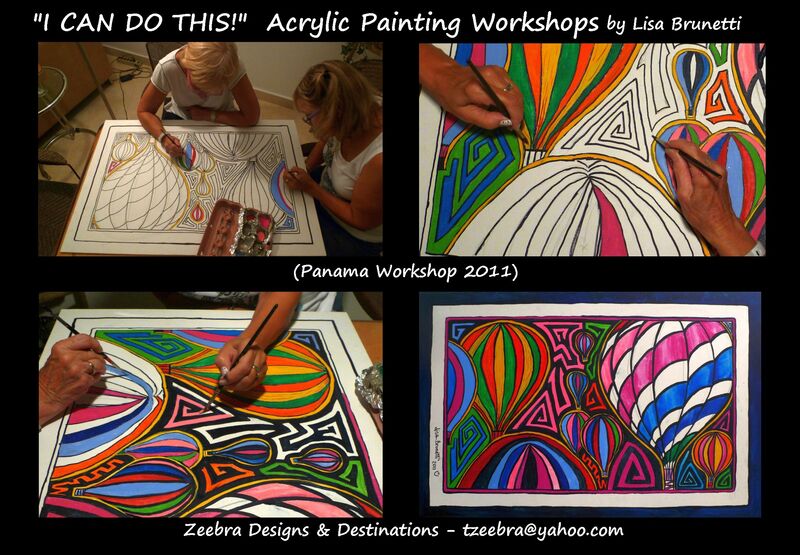 Oh how I want to do a “I can do it” workshop by you! I would love to learn how to design and color this kind of art ( as a complete beginner of course!). 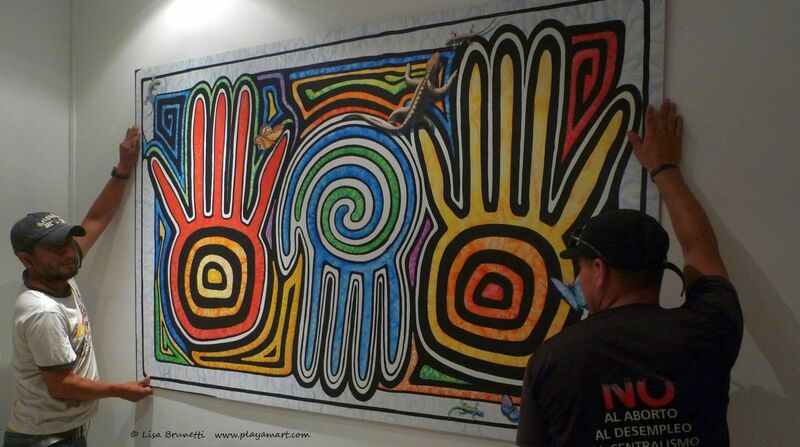 I love the hands painting. Great post! qué interesante and qué colores ricos! Love the Art work. Vibrant, happy, just full of life and colors. I also thank you for telling us about the Kuna people. So sad that they’re already having to move away from their island homes. 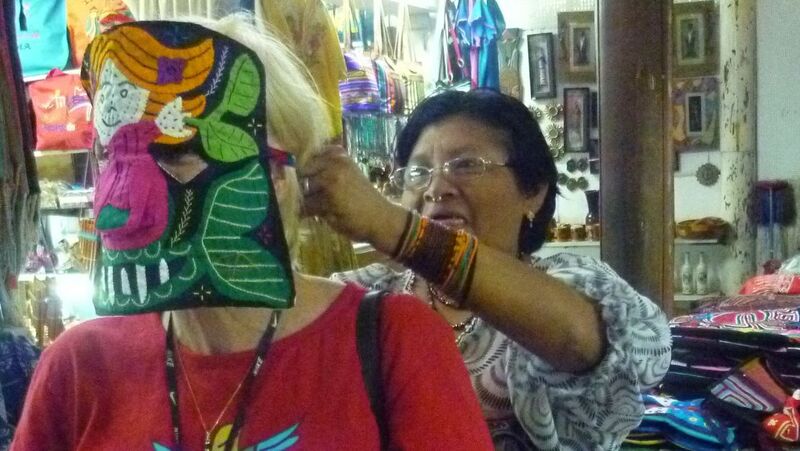 I LOVE all the colors of the molas in your post. I have a few molas which I bought in the 1970’s but don’t know where they come from. The Kuna Indians’ unique ‘mola textiles’ = the center of your inspiration! si, they certainly triggered a new style of work for me! i’m way way behind on comments and reading posts, but look forward to when i can catch up w/yours. 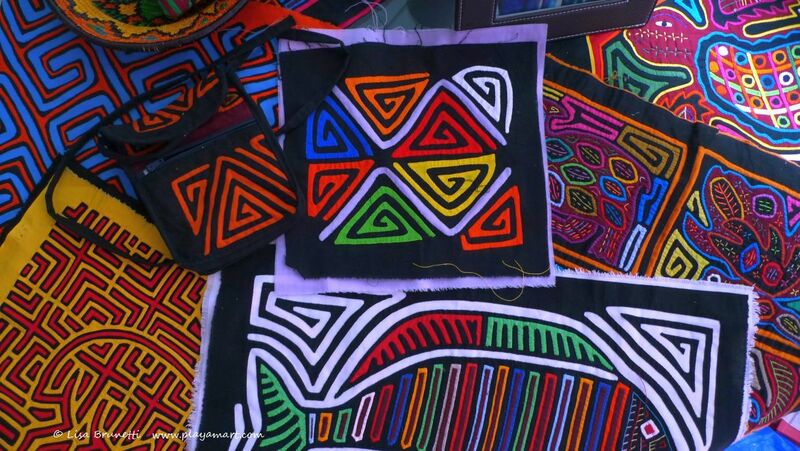 I never tire of your posts on the amazing Kuna or their fabulous Mola textiles Lisa, so thank you for veering off 🙂 Your photographic account of how the paintings evolve is just fascinating! thanks, amiga! the present painting, ‘if fish could fly’ is writing its own script! it’s late night/early morning here, and i just finished a long session. now i’m transferring some music for a road trip that starts in about six hours!!!! thanks, as always, for your positive feedback regarding my art! How lovely, Lisa! Thanks for that 🙂 I love their work and you captured wonderfully with your painting. thank you.. i hope that my next trip to panama,i can spend some time with them on the islands… i’d love to study their ways and show them my painting style as well. yes, their work is amazing. Great post and very informative! Thank you for your introduction to Kuna.